CKX is standing in solidarity with Wet’suwet’en Hereditary Chiefs and the land defenders of the Unist'ot'en Camp. In this Fieldnote, Alexander Dirksen shares his reflections on Canada’s commitment to reconciliation and the ways with which we must hold elected officials of all parties to a higher standard of allyship and action. Last month I spoke at the second RavenSPEAK gathering, a powerful evening amplifying Indigenous leaders (videos of the talks can be viewed here). My talk, entitled “Decolonizing Reconciliation,” was written as a means of personally processing my mounting frustration and disappointment with a federal government that came to power promising a fundamentally different relationship with Indigenous peoples. As I reflected on these campaign commitments and our current realities (from a failure to respond to the Jordan’s Principle to a pipeline purchased without Indigenous consent), I grappled with how this reconciliation rhetoric is failing to translate into tangible action, reform or justice. What the prime minister did not mention in his calculated remarks was that the Unist’ot’en Camp has existed since 2009, serving as a space for healing retreats and culture camps (“Heal the People, Heal the Land” serves as a powerful testament to the healing fostered through the camp). Nor did he address that the unceded territories upon which the camp stands are at the heart of the historic Delgamuukw Case of the Gitxsan and Wet’suwet’en Nations, which affirmed the rights of Indigenous peoples to their ancestral territories. Whose laws, whose order and ultimately, whose interests are being upheld by our federal government? In a country of historical and modern treaty, Section 35 rights, and legal precedent (including the Tsilhqot’in decision), what do the images of militarized police forces challenging peaceful protesters tell us about the state of “reconciliation” in this country? Where I hoped to see signs of change, I instead see echoes of the Oka Crisis, with elected officials siding with industry and economic interests over unwavering ancestral rights. Photo credit: Solidarity with Unist'ot'en by Tony Webster (no changes made). This week’s Cabinet shuffle is a telling development, particularly in an election year. Canada’s first Indigenous Justice Minister, Jody Wilson-Raybould, moved to Veteran’s Affairs, while Minister of Indigenous Services, Jane Philpott, was shifted from the role she held since the establishment of the department in 2017 to the Treasury Board. If the federal government’s relationship with Indigenous peoples is so sacred, why shift the ministers overseeing the portfolios most directly responsible for charting a new path forward? For work rooted so deeply in relationship, it is not merely a matter of picking up where one has left off around such critical files. That the shuffle came as a surprise to some Indigenous leaders (as did the dissolution of INAC in 2017) reveals a continued lack of meaningful consultation and transparency in a self-proclaimed era of nation to nation relationships. In speaking to these recent developments, it is important to reaffirm that disappointment and betrayal are not unique to a single political party or politician. Our federal government has long operated on the principle that the rights of Indigenous peoples are to be honoured, celebrated and respected… so long as these rights do not run counter to the hopes and aspirations of politicians on Parliament Hill (a truth delivered powerfully by MP Romeo Saganash late last year). Until this reality changes, the hope of reimagining colonial structures of oppression into tools for decolonial transformation will remain elusive. What does reconciliation mean to you personally, outside of your party platform? How have you embodied meaningful allyship through advocacy and action in your own life? Are you willing and ready to leverage your power and privileges to challenge the status quo, even if it impacts your poll numbers or future electability? What would this look like specifically in this riding and in your role? Ongoing acts of solidarity with the Wet'suwet'en Nation across the country reflect a growing understanding of and commitment to reconciliation by a growing number of Canadians. It’s now time to carry this energy into the election. No elected official should receive our vote unless they are able to clearly articulate the ways in which they will serve in allyship and relationship with Indigenous peoples and Nations. As campaign platforms are assembled, we must keep these critical questions at the forefront of our political discourse, making it clear that it is the interconnected issues of land, water and lives that matter most. 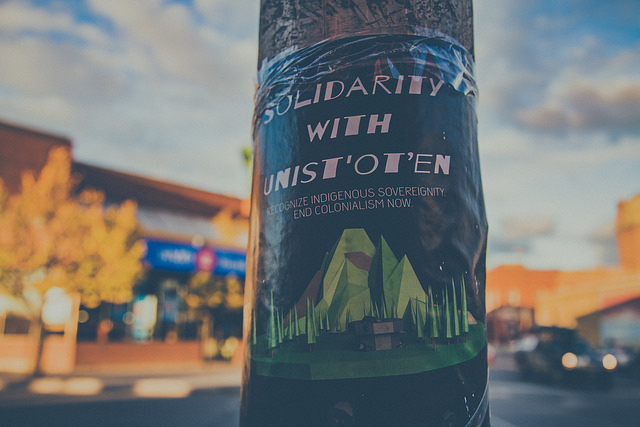 The Unist’ot’en Camp outlines a number of ways to support in a recent post, including donations to the Unist’ot’en Camp Legal Fund and the Gidimt’en Access Point Fund. Support the Coast Protectors by signing up for Action Alerts or making a donation. The First Nations Child and Family Caring Society (instrumental in advancing the Jordan’s Principle) highlights 7 free ways to make a difference. Engage directly with your elected officials — names and contact details for your Member of Parliament can be found here. For philanthropic organizations who are not yet members of The Circle on Philanthropy and Aboriginal Peoples in Canada or signatories of The Philanthropic Community's Declaration of Action, join CKX in committing to undertaking the necessary work to do so this year. As a social change agency, CKX emboldens shift disturbers with opportunities for reflective practices, place-based learning and deep knowledge exchange to spark fundamental shifts in our society. Our Fieldnotes serve as a space with which to share perspectives, insights, lessons learned and calls to action around the types of fundamental shifts we seek to support through our work.